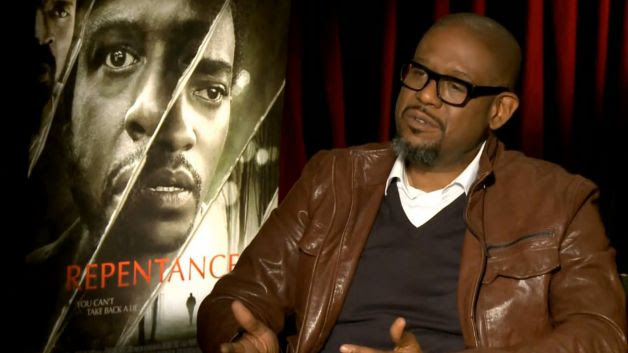 Forest Whitaker is the kind of actor who cannot be pigeonholed. Whether playing an mafia hitmani in Ghost Dog: The Way of the Samurai, a British Soldier in The Crying Game, or a sadistic dictator in The Last King of Scotland, Whitakers makes characters come to life. 2013 was a great year for the critically-acclaimed actor. He earned rave reviews and Oscar buzz for his title role in Lee Daniels’ The Butler, produced the phenomenal indie hit Fruitvale Station, and starred opposite Jennifer Hudson and Angela Bassett in Black Nativity. For many actors, such success would go to their heads. Fortunately, Whitaker has remained humble and committed to honing his craft and stretching the boundaries of black independent films. His latest movie, Repentance, from Lionsgate and Codeblack Films, is a dark thriller. In it, he plays Angel Sanchez, a profoundly troubled man fixated on the “untimely” death of his mother. When therapist/spiritual advisor Tommy Carter takes on Sanchez as a personal client in an effort to raise funds for his indebted brother Ben (Mike Epps), things quickly take a turn for the worse. Whitaker talks about his new movie, independent film, and the Academy Awards in this interview with BET.com. Repentence opens in limited release on February 28. Click here to watch the trailer.